Edmonton's Connor McDavid (center) celebrates his goal against the Vancouver Canucks during the third period of an NHL hockey rookie tournament game Friday in Penticton, British Columbia. PENTICTON, British Columbia — Connor McDavid, the No. 1 pick in this year’s NHL draft, had a goal and an assist for the Edmonton Oilers in his professional debut Friday night, an 8-2 victory over the Vancouver Canucks in the Young Stars tournament opener for both teams. The 18-year-old McDavid set up a great chance moments after the opening faceoff and picked up his first point with an assist on Darnell Nurse’s power-play goal in the second period. McDavid scored his first on a deflected shot in the third. ”I got hit. 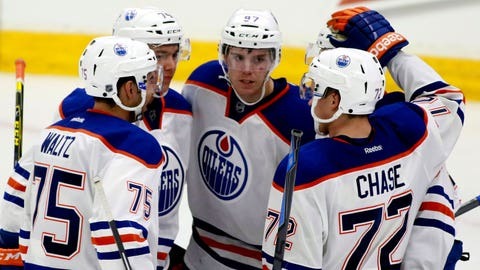 It was part of the game, whatever,” McDavid said. Chants of ”Let’s go Oilers!” rang out in the South Okanagan Events Center as long-suffering Edmonton fans, many of them wearing newly minted No. 97 McDavid jerseys, filled the arena.